After a bit of deliberation, I’ve decided my Halloween game this year will be Penumbra: Black Plague. This gives me an opportunity to devote this update to telling anyone who might not know about the first horror series from the makers of Amnesia: the Dark Descent. Both the Penumbra games — Overture and Black Plague Gold for PC, Mac, and Linux, are $2.50 each for Steam’s Halloween sale too. To describe them, I’d say they’re pretty much an old school Resident Evil game in first person with a far more vulnerable player character. I guess you could say that’s what Amnesia is too, with its focus on exploring dark places and solving puzzles while being stalked by undefeatable enemies. For some reason Overture (the only of the two Penumbra games I’ve actually completed) feels even more like RE. It’s probably because Penumbra is set in a modern (or close to modern) setting that kinda looks like RE. Maybe it’s because Penumbra actually has a slice of combat in it. Well, you can TRY to fight enemies unlike in Amnesia, but you still can’t really win. I think you can knock out a zombie dog for like 10 seconds and you might be able to kill the spiders but I’m not sure. You never get any firearms. The best option is always to run and hide which is what makes the tension in Frictional’s games feel very much like horror movies. Overture basically has you trying to escape from some frozen industrial ruins in Greenland which mostly involves solving puzzles along the way while sneaking around enemies. This could range from finding keys to figuring out industrial machinery later on, which is why I drew comparisons to RE. The game even has save points that kind of work like typewriters. A while ago I went back to play the Gamecube remake of the first Resident Evil, and was reminded of the loading screen animations of the doors opening each time you entered a room. I used to hate that but looking back it actually adds tension to the act of entering new areas. I never thought that could be replicated without some kind of transitional animation, but Penumbra manages to do it through pure atmosphere. When I’m in the dark in this game and I just ran away from some dogs I end up slowly peeking past each new door, then just staring into the darkness beyond it for a good 10 seconds before finally deciding to walk in. It’s that kind of atmosphere that makes each new location in Overture more unsettling than the last. One of that game’s moments that sticks out in my mind is a particularly effective “jump-out” scare in the late parts that doesn’t actually involve anything jumping out at you. 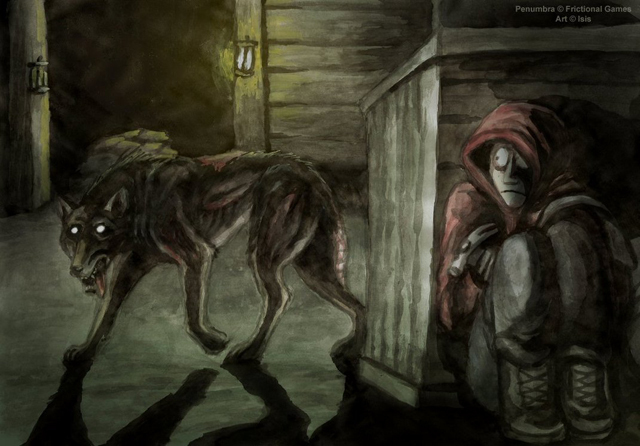 I really do think Penumbra is one of the best choices you could go with if you’re looking for a Halloween game. Definitely one of the most underrated. This goes double if you’re looking for a more traditional survival horror experience in this day and age. I think of this writing Demon’s Souls is $15 on PSN. This new game on Steam looks good: Valdis Story: Abyssal City. http://t.co/sW1SHXMXRZ Demo on the official website.